Basic Information: What Is Research Verified Insomnia Relief? 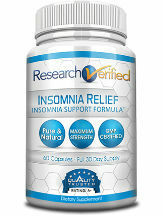 In this review of Research Verified Insomnia Relief, you will know some of the most important details about this product, especially its ingredients and how it should be taken. As claimed by the manufacturer, this product is made with the use of well-researched ingredients that are capable of regulating an individual’s sleep-wake cycle, making it effective in the alleviation of insomnia. As it helps in improving sleep quality, it also reduces stress. The manufacturer takes pride in using ingredients that have been carefully chosen by experts. All of the ingredients have undergone clinical testing to prove safety and effectiveness. They also make sure that the right amount of each ingredient is used in order to enhance their potency. From the label, the manufacturer suggests that two to four capsules should be taken every day. The last capsule should be taken an hour before you go to sleep. From the website of the manufacturer, one bottle of Research Verified Insomnia Relief, which contains 60 capsules, is being sold at $48 each. This is 31% lower than the regular list price of $69.95. The product can also be purchased on three or six-bottle packages, which will be good for three or six-month supply. Buying these packages is preferred by many because they make the price cheaper. In the three-month package, the price per bottle is reduced at $33. On the other hand, for the six-month package, each bottle is sold at $24. By taking the product, as it has been claimed by the manufacturer, your sleep-wake cycle will be normalized. With this, you can expect that you will be able to sleep quicker and longer. More so, you can also anticipate sleep disturbances to be fewer. It has ingredients that will help you to combat stress, which is another reasons why it can improve sleep quality. Generally speaking, there are no known side effects associated with the use of Research Verified Insomnia Relief, basically because it is made with the use of all-natural ingredients. To prevent side effects, it is important to follow the recommended dosage. Additionally, nursing or pregnant mothers, people below the age of 18, or those who have existing medical conditions are highly recommended to consult with a physician before taking the supplement. While there are no customer reviews published in the website of the manufacturer, you can be confident about its quality because of the 365-day money-back guarantee. Within a period of one year, if you are unhappy with its use, or if it does not resolve your insomnia problems, you can have it returned and you will be provided with a 100% unconditional refund. With Research Verified Insomnia Relief, as claimed by the manufacturer, there is no more need to suffer from sleepless nights. It is made with the use of high-quality ingredients, which have been clinically-tested to prove their safety and effectiveness. Additionally, the manufacturer offers a 365-day money-back guarantee, giving you the confidence that you will be provided with the best value for your money. This site is dedicated to providing you with the best information regarding insomnia, its causes, characteristics, helpful hints and the best possible options for overcoming this challenging condition. Suffering from insomnia, affects millions of people, with many experiencing symptoms at some stage in their life. Characterized by difficulty in falling and/or staying asleep, people who suffer from insomnia, know too well the debilitating impact it can have on their lives. The causes of insomnia differs between individuals as does the severity of symptoms. Whatever the cause and however it affects you, insomnia can negatively taint lives influencing family, work, personal balance leading to detrimental consequences. In short, the symptoms of insomnia interfere with the ability to function normally in everyday activities. We provide you with impartial, up-to-the-minute information regarding insomnia. This condition is incredibly common, especially in today’s fast paced hectic lifestyle. Symptoms include fatigue and malaise throughout the day, irritability, problems with concentration and memory. Insomnia can be brought on by significant life stress, illness, emotional or physical discomfort and medication. Work schedules can also play a part as can jet lag after long haul travel. For some people, the symptoms can be mild and not last long at all, for others, the symptoms can be life changing and seem to take forever to end, if at all. Insomnia suffering need not be the case. There are measures you can take to control symptoms and manage insomnia. We are here to help. Is Feng Shui the Answer to Your Sleep Problem?